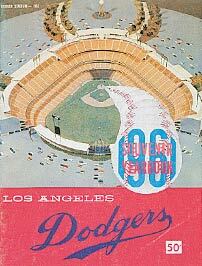 The 1961 season would be the last in the vast and temporary home of the Dodgers, the Los Angeles Memorial Coliseum. 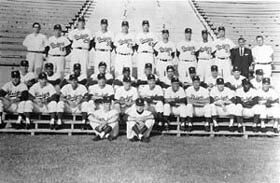 Although the Dodgers were actually favored in preseason polls, they could not quite fulfill the experts’ predictions and wound up in second place, four games behind Fred Hutchinson’s Cincinnati Reds. Despite the second-place finish, Walter Alston and company had many positives during the season. Among them was the emergence of 25-year-old left-hander Sandy Koufax, who won 18 and lost 13 with a 3.52 ERA. He set the National League record for most strikeouts in a season with 269. Koufax led the league with the fewest hits per nine innings with 7.46. Johnny Podres topped the N.L. with a .783 winning percentage to go along with his 18-5 record. Don Drysdale slipped to 13-10 but still had the third-best strikeout total in the N.L. with 182. With Stan Williams’ 205 strikeouts, good for second in the National League, the pitching-rich Dodger staff led baseball once again with 1,105 K’s. While Larry Sherry had arm problems, he still was 4-4 with 15 saves, while left-hander Ron Perranoski, acquired in a trade with the Cubs for Don Zimmer in 1960, had spent a year in the minor leagues and was called up to finish 7-5 with 6 saves and a 2.65 ERA. The offense was still paced by Wally Moon, who batted .328 with 17 home runs and 88 RBI. Left-hander Ron Fairly, who played first base and outfield, batted .322 with 10 home runs and 48 RBI. Snider contributed a .296 batting average to combine with 16 homers and 56 RBI. Maury Wills topped the N.L. again in stolen bases with 35. Catcher John Roseboro had a team-high 877 putouts. The Dodgers lost 10 straight games in August and September, preventing them from any pennant hopes. 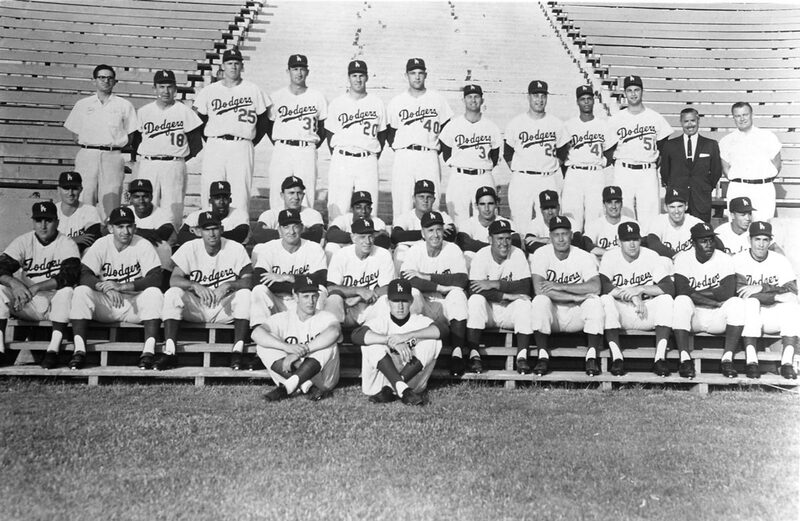 In the final game played at the Los Angeles Memorial Coliseum, the home of the Dodgers for four seasons in L.A., the Dodgers defeated the Chicago Cubs, 3-2 in 13 innings on Sept. 20, 1961. Koufax pitched a complete game, struck out 15 batters and threw 205 pitches. Fairly stroked a game-winning single and Moon carried home the final Coliseum run. 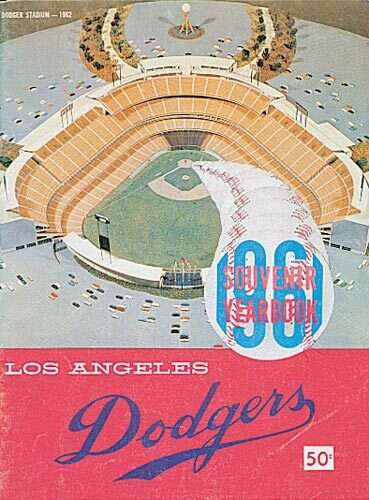 A total of 743 home runs were hit at the Coliseum, including 346 by the Dodgers. Click image for a larger view1961 Dodger YearbookCopyright © Los Angeles Dodgers, Inc.
Click image for a larger view1961 DodgersCopyright © Los Angeles Dodgers, Inc.
Al Campanis, Director; Dwight (Red) Adams, Cliff Alexander, Hugh Alexander, Romanus (Monty) Basgall, William Brenzel, John S. Carey, Leon Hamilton, Andy High, Tom Lasorda, Hank Majeski, Kenneth Myers, Harold (Lefty) Phillips, Jake Pitler, Rudy Rufer, Jack Warner, Jim Weaver, Bert Wells.